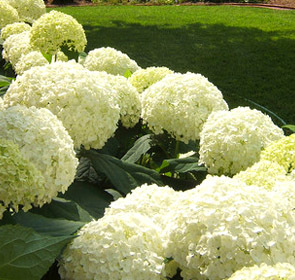 Annabelle is a stunning white hydrangea, often producing heads over 10 in. in diameter. Unlike the better known blue and pink hydrangeas (macrophyllas), Annabelle blooms every year even after severe pruning or intensely cold winters. The huge, white drumstick blooms appear in profusion without fail. This spectacular hydrangea is the one we recommend for customers in colder climates because it flowers on the current year's growth. Some say it is hardy even into Zones 2 and 3 in the United States ( authorities say to Zone 3). Cut to the ground at the end of winter, it can achieve a height of six feet and bear masses of huge rounded heads of white flowers up to ten inches across. Uncut, the shrub can reach ten feet or more, but the flower heads tend to be smaller. Some people plant 'Annabelle' as a hedge since it can be cut back severely in the winter for a tidy effect. Forms of H. arborescens are actually native to eastern parts of the United States. If your climate is too harsh to grow macrophyllas, 'Annabelle' would make a wonderful alternative.